The Caney was hot this past weekend with most all fisherman reporting good fishing. 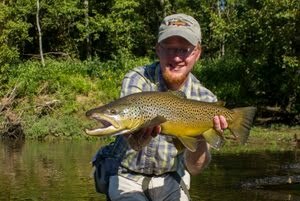 I floated again with David Perry and the streamer bite was sick. I started out at the casting brace with an agreement of changing every five fish. A skipjack got things rolling but soon the nice rainbows started coming to the net. Soon it was time to switch so I rowed while David P. fished. After putting a few fish in the boat we switched again and found out just how good the fishing was. Fishing down a bank, I was literally getting a fish, follow, or strike on every cast. The fish were all on the feed and couldn't get enough of our streamers. Talking to several other fisherman, it appeared that lots of techniques were working well. The only thing lacking was the big browns which didn't really every come out to play. We did have a few follows and some hard strikes from fish we never saw, but at the end of the day, no large browns had been put in the net. One thing that was very exciting was the growth of the brookies. The largest we boated was just under 14 inches and fat. So far it seems that the brook trout are being stocked in decent numbers and are keeping away from the big browns. There is plenty of food in the river and the fish are healthy. If they can survive the summer we should be seeing a few in the 16 inch range this next fall. Rain. Temps in the 30s and low 40s. Camping. Not normally a recipe for good camping, some friends and I decided to battle the elements as we were all free this past weekend. We wanted to do a long hike in preparation for a trip to the Grand Canyon in another couple of weeks. Amazingly, despite the bleak forecast, the weather actually turned out very well. Friday night featured just some very light drizzle that quit once we set up camp. Saturday turned out to be partly cloudy which meant we had some great views once we got to the higher elevations. For the most part the camera stayed in its case. The light was a little weak, and I knew that the pictures I stored in my mind were much better than anything my camera could accomplish. Our hike took us up the Anthony Creek Trail out of Cades Cove to the Bote Mountain Trail. Ascending up to the AT, we then took a right turn and headed west for three miles. In the process we took in views from Spence Field and Russell Field. Our route back down was the Russell Field Trail which connected to the Anthony Creek trail. Several hours and close to 15 miles later, we were back in camp, all a little sore, but everyone agreed that the hike was well worth it. Sunday I planned to do a little fishing. The morning dawned overcast and stayed that way up until we headed out of the Cove. 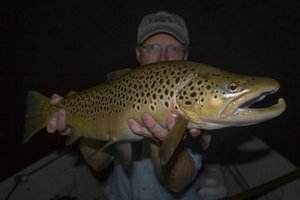 I was excited because the low light conditions increased the odds that some large browns would be out feeding. Sadly, as we drove back down Laurel Creek Road towards Little River, the clouds thinned and soon broke completely. The day turned out beautiful but not so good for fishing. I still managed some small rainbows and even got a 14 inch brown to come attempt to eat. Unfortunately I set the hook too early and missed out on pictures of the nice fish. After a great day of hiking this past Saturday, I knew that getting out on Sunday was definitely necessary. The Smokies have been calling for weeks so I finally made the drive over with a couple of friends. We planned on having a relaxed day with a little hiking, a little fishing, and most of all just enjoying the great outdoors. The drive over was uneventful. After a stop to pick up some sandwiches for lunch we headed into the Park. I stopped at a couple of favorite pools to look for big browns sitting out. Sure enough, in the first place I checked a very nice fish was out feeding. I watched for a good ten minutes but decided to leave it for the time being. We drove on to Elkmont and started up the trail. After hiking for a bit, we found a nice spot in the sun to hang out and eat lunch. Naturally I was in a hurry to sample the fishing so I rigged up and headed a couple hundred feet downstream to fish back up. The first several pockets and runs were seemingly devoid of life, but having fished often before in cold weather I knew that it was just a matter of time. The dry flies weren't doing the trick like I had hoped so I switched over to a pair of nymphs. Immediately the fish started to hit a Tellico and things progressed nicely. 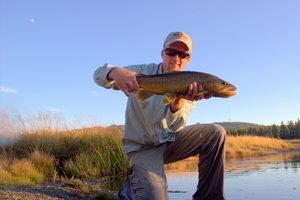 The first fish came right where I had left my friends lounging on a rock, and the three runs immediately above were also good to me. The rainbows are starting to color up for the spawn which should be starting soon. 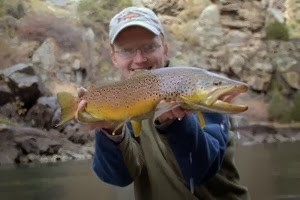 The river was in excellent shape, and I expect the fishing to be great this spring. Right now, it looks like old man winter will hang on for at least another two weeks. I would bet that the second week in March is a good bet for the first big hatches, but of course it is only a guess. After the sun started sinking below the ridge, we headed back down the trail. I stopped in a couple of spots to catch some more trout. Everywhere I expected to find fish produced well for me. 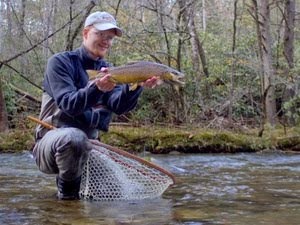 The fish were glued to the bottom for the most part at this elevation, but a weighted nymph and a couple of split shot did the trick.